Lausanne (SUI), 14 April 2019 — The eighth edition of the FEI Sports Forum 2019, which will be held at the International Institute for Management Development (IMD) in Lausanne (SUI) on 15 and 16 April, will be live-streamed on fei.org. Day 1 will begin with a session dedicated to gender equality, particularly in governance positions in equestrian sport. This will be followed by a session on preparations for the Tokyo 2020 Olympic and Paralympic Games with a focus on climate mitigation plans and the optimisation of equine and human performance in a challenging climate. The first session of the afternoon will be dedicated to a review of the FEI legal system, including a proposed way forward regarding pony measurement, as well as sanctions and measures related to Eventing Risk Management. The closing session of the day will look at the future of Reining. Day 2 will focus on Endurance with the whole day dedicated to the questions, challenges and reshaping of this discipline. Thirty-four entries competed in the $35,000 EMO Agency Grand Prix in the indoor stadium at the Jacksonville Equestrian Center. Cassandra Kahle of Califon, New Jersey in the irons of Redfield Farms’ Epeios rode away with the blue ribbon after a thrilling grand prix. Brian Moggre of Flower Mound, Texas and Major Wager, LLC’s MTM Vivre Le Reve was the first to go and the first to go clear in the first round in a time of 79.329 seconds. Just two rides later, Cassandra Kahl and Redfield Farm’s Wallstreet made it a jump off with their clear first round of 81.484 seconds. Flower Mound, Texas’ Tracey Fenney in the irons of MTM Farm’s Igor Van De Heibos made it a trio in the jump off with their clear first round in a time of 84.253 seconds. Haley Gassel of Lenoir City, Tennessee aboard Westwind Equine Training Center’s Quite Dark 2 was the next horse and rider team to advance to the jump off round with their clear first round in a time of 85.001. Rowan Willis of Williston, Florida and Lucinda Huddy & Rowan Willis’ Diablo also added themselves to the jump off roster after posting a clear first round in 81.630 seconds. Kahle returned to the course, this time in the irons of Redfield Farm’s Pyrenes De Louzes. The pair advanced to the jump off after a clear first round in a time of 81.106. Fenney and MTM Apple, owned by MTM Farm, joined the jump off roster after going clear in their first round in a time of 82.51 seconds. Amateur rider Kaitlyn Williams of Paoli, Pennsylvania rode her own Vedor through a clear first round in a time of 84.776 and joined the jump off. Holly Shepherd of Grand Bay, Alabama and Loretta Patterson’s Manchester also qualified for the jump off with their clear first round in a time of 81.256 seconds. Kahle returned to the ring, this time in the irons of Redfield Farm’s Epeios. The pair went clear in a time of 78.120 seconds. “I didn’t see where others struggled in that, but for me, everything was working well with the horses and the course,” she said. Moggre added another mount to the jump off roster, Major Wager, LLC’s MTM Los Angeles, with a clear round in a time of 82.589 seconds. Kyle Dewar and his own Clever Van De Helle were the final pair added to the jump off roster, after posting a clear first round in a time of 83.878 seconds. Rheinheimer set the jump off round with a time allowed of 49 seconds. First to go, Moggre and MTM Los Angeles went clear and set the new time to beat at 44.446 seconds. Kahle and Wallstreet followed. “I’ve been riding Wallstreet for some time now. He was my first Grand Prix horse and took me around some bigger classes that I’ve never done before. He has taught me so much. I haven’t shown him for a while and this was our first show back together. I have a real soft spot for him,” commented Kahle. The pair turned in a four fault jump round in a time of 45.819 seconds. Fenney and Igo Van De Heibos followed Kahle and Wallstreet. In a time of 55.937 seconds with four jump faults and seven time faults, the pair finished in eleventh place. Gassel and Quite Dark 2 followed in the order and with their time of 48.787 second with four jump faults, finished in ninth place overall. Willis and Diablo were up next and turned in a clear round with a time of 46.665 seconds, placing fourth overall. Kahle and Pyrenes De Louzes followed and their fault free round in 47.809 seconds finished them in fifth overall. “’Pyro’ is my old guy. He’s sixteen this year and I rode him for the first time at this horse show three years ago. I have gained a lot of experience on this horse. He’s strong, so I have a hard time going fast with him, but tonight we were really good,” she said. The pair ended up fifth overall. Fenney and MTM Apple followed in the order and earned four jump faults in a time of 45.466 seconds, which earned them sixth overall. Williams and Vedor earned four jump faults and five time faults for their time of 49.005 seconds which earned them a tenth place ribbon. Shepherd and Manchester had twelve jump faults and seventeen time faults for their 65.618 second jump off round which placed them twelfth overall. Kahle and Epeios were up next. The pair turned in a fault free round in a time of 44.432 seconds and set the new time to beat. “The toughest part of the jump off was the skinny to the oxer and you needed to be pretty straight. Actually, the two to the five was pretty tough too. The five turned out to be forward and Epeios has so much heart and is so strong, it worked. The jump off overall was twisty and turny and you still had to ride it neat and fast,” commented Kahle. “Indoor riding is a bit tough because you don’t have a lot of time to get going; you just need to get in there and just go,” she said. Moggre and MTM Los Angeles followed Kahle and went clear in a time of 45.299 seconds, not fast enough to take the lead. Dewar and Clever Van De Helle were the last to go. Four jump faults in a time of 47.926 seconds saw them finish in eighth place overall, leaving Kahle and Epeios victorious and Moggre with second and third with MTM Vivre Le Reve and MTM Los Angeles, respectively. “I think Brian [Moggre] is incredible,” said Kahle. “He can take a fast horse and make him faster,” she said. “You see, I’m not a very fast rider. But my advantage was that my horse is very fast and he’s really fast across the ground. I did as close to the same track that Brian did and this time; my horse was just a bit faster. He’s a really cool horse. I’ve been riding him for a bit over a year now. He had shown up to 1.35 m when I got him and last summer we started doing the 1.45 m and some 1.50 m. He has so much blood and fight in him; I’m really lucky to have him,” she said. Gambling online is now being legalized in a number of states. It looked like Michigan would be following in the footsteps of New Jersey, Nevada, Pennsylvania, West Virginia, and Delaware in 2018, but after former Governor Rick Snyder vetoed the legislation, the matter of MI online betting has seemingly been put on hold. Michigan online gambling has technically been allowed since 2014, when the Michigan Lottery was launched. In addition, Michigan sports betting in the form of horse racing, greyhound racing, and Fantasy Sports have been available for a number of years too. Therefore, it’s not a huge stretch to imagine that the MI online betting legislation will be passed in the near future. Located in the Detroit suburb of Northville, Northville Downs was the first track in Michigan to offer standardbred, pari-mutual wagering. It has been in existence since 1944, making it the senior pari-mutual racetrack in Michigan. Farmington Hills-based homebuilder Hunter Pasteur Homes is under contract to buy the Northville Downs horse racetrack and redevelop the 48-acre property for housing. The harness racetrack’s land has long been sought by developers in upscale Northville, but the project wouldn’t necessarily end horse racing in the area. Northville Downs, Michigan’s last horse track since Hazel Park Raceway closed earlier this month, will remain open until the development begins. The track’s owners will seek to continue racing and wagering operations “at an area in close proximity to its current location,” according to the statement from Hunter Pasteur Homes. A race calendar is available on the state’s website. Northville Downs currently is open seven days weekly for harness and thoroughbred simulcast wagering, and Friday and Saturday evenings for live races which returned March 22nd. Northville Downs stated that live harness racing and simulcast wagering will continue at their current location through 2020. They are in the process of exploring multiple other locations to develop a first-class, state-of-the-art racing and gaming facility that Michigan will be proud of. They will continue to work closely with state and local representatives to implement the necessary changes that other states around us have, so they can bring racing back to its finest. It has been stated that it is unclear if the track’s ownership will open a new facility regardless of changes in Michigan’s gaming laws, which prevent tracks from adding non-horse gambling like slot machines, or if it will build anew even without more forms of wagering. Northville Downs is a half mile harness track located in Northville a suburb of Detroit. Opened in 1944, it had been recognized as the first successful harness track outside of New York State. The years have taken their toll on Northville, it does have a winterized, glass enclosed grandstand, and clubhouse. The clubhouse seating 2,000, which includes a dining room with 450 seats, the grandstand seats another 5,200. Live racing is held at night and simulcasting is available year-round. The stables can accommodate 750 horses. There is parking for 2,500 cars. Northville Downs currently is open seven days weekly for simulcast wagering, and Friday and Saturday evenings for live races. Thoroughbred Racing in Michigan could return in 2020. AmRace & Sports LLC was granted a conditional license by the Michigan Gaming and Control Board for Thoroughbred racing at Sports Creek in 2019 but due to sale and legislation changes, Thoroughbred racing is now slated to come back to the state in 2020. The Onaqui mustangs are among the most famous and most photographed wild horses in the world, visited by tourists far and wide. The Bureau of Land Management’s cruel plans would sever family bonds en masse, ripping 80% of this herd from their lands and their companions. Animal activists from across the country gathered in Utah to speak up for the horses on Friday, April 5. Advocates met with Utah Bureau of Land Management officials after the rally and made some progress in protecting these wild horses. Although more meetings between the advocates and the BLM are scheduled in the next few weeks, the mustangs’ safety is far from secure. Without your urgent help, their future is bleak. It is crucial that we keep up the pressure to let the Bureau know we will not let up in our efforts to protect this herd. Call the Utah Bureau of Land Management (BLM) office Wild Horse & Burro department (801) 539-4001 ext. 4050. Send our email (with your personal touch) to the BLM’s Utah Office. The hunters descended on the Jacksonville Equestrian Center Week II of the Jacksonville Spring Classics. The featured hunter competition, the $25,000 USHJA International Grand Prix, sponsored by Glen Kernan Golf and Country Club, saw thirty-five horse and rider teams compete on the grass derby field over a course designed by Paul Jewell of Lambertville, New Jersey. Well-known professional rider, Kelley Farmer of Wellington, Florida, had four mounts in the International Hunter Derby and rode away with the win in the irons of David Glefke & Oakmont Stables, LLC’s Namely. The pair earned an overall score of 370, just beating out second place finisher, The Full Monty, owned by Woodrun and ridden by David Jennings of Franklin, Tennessee, who scored an overall 369.50. “I knew David [Jennings] had won this class before and he rides beautifully. His horse is really seasoned and I knew he was going to try to be handy and go nicely. So on Namely I knew I had to be quite handy. Namely is really rideable and I was able to be nice and tidy and jump the high options and fortunately he went nicely and got great scores. I made a mistake in the handy round on my other horse Consent who was on top after the Classic round, so it was nice to be able to come back with Namely,” she said. “We own Namely with Darrah Kenney and his first horse show in the States was Week XII at WEF. He was champion in the High Performance competition and I rode him in the $15,000 Derby on the field there last Friday and he was great. It did him good to have a week to get more acclimated here. Namely tries very hard and he’ll do whatever you want,” said Farmer. “Paul [Jewell] did a great job designing the course. The course was inviting and not overwhelming for a young horse. While we’re big fans of grass fields, it can be spooky for a young horse. While the course was tough enough, it wasn’t overwhelming and rode nice and smooth – it was very inviting. He didn’t build anything that was too much for them,” Farmer commented. “There aren’t too many classes on grass fields anymore and the horses aren’t acclimated to it. We personally jump on them all the time at home and in Kentucky and our horses are pretty comfortable in that situation. But so many other shows just keep using rings and so a lot of horses aren’t used to it,” she added. Third place was awarded to MTM Outbid, owned by MTM Farm and ridden by Flower Mound, Texas’ Tracey Fenney. The pair earned an overall 369. Jennings returned for a fourth place ribbon, this time in the irons of Woodrun’s Attention Please after earning an overall score of 361.50. Farmer returned for a fifth place ribbon for her performance with David Glefke & Kent Farrington, LLC’s Consent after earning a combined score of 359. Barbara Risius’ Longsteet, piloted by Holly Shepherd of Grand Bay, Alabama, picked up a sixth place ribbon for their overall score of 356.50 and Farmer, in the irons of David Glefke’s Worthy, earned a seventh place for their overall score of 352. Cora, owned by Debbie Smith and ridden by Jaime Gibson of Ocala, Florida, earned an overall score of 347 and placed eighth, while As Quoted, also owned by David Glefke and ridden by Jennifer Jones of Ocala, Florida, placed ninth for their score of 328. Charismo, owned by Wilbur Show Stables and ridden by David Wilbur of Ocala, Florida, placed tenth for their score of 326 and Cupidon, owned by Mark Hayes and ridden by Brian Moggre of Flower Mound, Texas, placed eleventh with their score of 319.50. S & L Lion King, owned by S & L Farms and ridden by Dorothy Douglas of West Bridgewater, Massachusetts, placed twelfth with their overall score of 307.50. Farmer commented, “The course was nice. That field is really nice and Bob puts on a great show here every year. It’s always lovely and it’s nice that he keeps having this class. We really appreciate people like him who do this for the hunters,” she said. 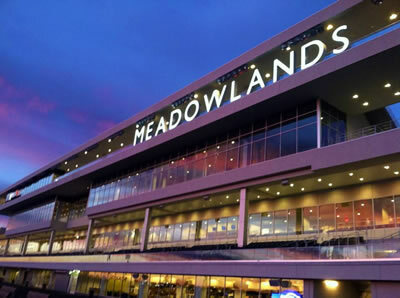 The Meadowlands Racetrack (currently referred to as Meadowlands Racing & Entertainment) is a horse racing track at the Meadowlands Sports Complex in East Rutherford, NJ, United States. The track hosts both thoroughbred racing and harness racing. It is known popularly in the region as “The Big M”. Meadowlands has year-round horse racing as well as a number of bars and restaurants. Here is a guide to New Jersey betting on sports online to will help you get on your feet. The online sports betting in New Jersey has been legal for almost a year now. The NJ online sportsbooks allow you to bet on games on their website or through the operator’s mobile app if such feature is available. Therefore, you can enjoy the experience of engaging in NJ online sports betting without having to leave the comfort of your home. Opened in the mid-1970s, Meadowlands Racetrack held its first-ever harness race on September 1, 1976 while thoroughbred racing commenced on September 6, 1977. With the exception of the opening season of 1976, autumn has been dedicated to the thoroughbreds, while the rest of the year features standardbreds, or harness horses. The Meadowlands Racetrack has been the site of the Hambletonian, the first leg of the Trotting Triple Crown, since 1981. It has also been home to the Cane Pace, the first leg of Harness Racing’s Pacing Triple Crown since 2015 with the Cane run on the same program as the Hambletonian. Monmouth Park, the Meadowlands, and Freehold Raceway will receive purse subsidies in 2019. The money allocated under the new law will go toward enhancing the winnings, or purses, paid out to the highest finishers at races. In general, higher purses means tracks can attract more horses, which in turn leads to more wagering by spectators and more business for the tracks and ancillary workers. Monmouth Park, the state’s only thoroughbred track, will receive $10 million for purses in the current fiscal year, which ends June 30, with the Meadowlands Racetrack and Freehold Raceway, both standardbred tracks, getting $6 million and $1.6 million, respectively. The remaining $2.4 million will go toward breeding programs and other purses. On June 11, 2018, New Jersey became the third state to legalize sports betting, after Nevada and Delaware, with Gov. Phil Murphy signing the legislation into law. Sports betting in New Jersey began when a sportsbook opened at Monmouth Park Racetrack on June 14, 2018. Following this, sportsbooks opened at the casinos in Atlantic City and at Meadowlands Racetrack. In June 2018, Paddy Power Betfair announced that it had partnered with Meadowlands to open a sportsbook at the track, following the state’s legalization of sports betting (as facilitated by the result of Murphy v. National Collegiate Athletic Association). The sportsbook opened on July 14, 2018, under the branding of FanDuel, a daily fantasy sports service recently acquired by the company. In May 2018, the Supreme Court ruled in the case in favor of New Jersey, ruling that the 1992 federal ban on sports betting in most states violated their rights. After the ruling, several states, including New Jersey and Rhode Island, prepared to legalize sports betting. Live and thrilling standardbred racing at Freehold NJ Raceway was established in 1853. The Freehold Raceway features live standardbred races and thoroughbred racing simulcasts from tracks all over North America. The raceway is open seven days of the week and the thoroughbred simulcasts schedule can be found here. New to this speed sport? The raceway offers an online betting guide found here and if you can’t experience the race live, just place your bet online or over the phone. Carson Kressley competes in front of a packed crowd at the Devon Horse Show and Country Fair. Photo by Brenda Carpenter Photography. Devon, Pa. – April 9, 2019 – A vision of spirited beauty and power, the American Saddlebred excels in the show ring, demonstrating two unique gaits to the breed: the Slow Gait and the accelerated Rack. Tracing the breed’s ancestry to the early 1700s, the classic American Saddlebred will once again be showcased in a variety of divisions because of their incredible versatility at the historic Devon Horse Show and Country Fair, scheduled this year for May 23 – June 2, 2019. Saddlebred and Hackney competition will take place from Wednesday, May 29 through Saturday, May 1. Spectators can expect to see all of the five primary disciplines represented at the Devon Horse Show: Three-Gaited, Five-Gaited, Fine Harness, Park, and Pleasure. The $5,000 Three-Gaited Saddlebred Stake is the most anticipated class of the Walter Mooney American Saddlebred Three-Gaited Section. Any entries that participated in another class of the section can take part in the Friday evening stake at the Dixon Oval. Characterized by a trimmed mane to emphasize their long and elegant neck, three-gaited horses show in trot, canter, and animated walk. Celebrity Saddlebred exhibitor and judge of the Ladies’ Hat Contest at Devon, Carson Kressley, picked up his first tricolor ribbon aboard Famous Kiss in the Open Three-Gaited Park Horse Stake in 2016. Another crowd favorite in the Five-Gaited Section is the $3,000 Five-Gaited Saddlebred Stake, which will also take place Friday, May 31st under the lights of the Dixon Oval. Five gaited horses have been taught two specific four beat gaits that are either performed slowly or with rapid, high steps. The pleasure divisions are always a favorite for exhibitors and spectators alike as riders showcase their mounts in the Dixon Oval. These events will take center stage Wednesday, May 30th through Sunday, June 2nd. Highlights will include the English Pleasure, Country Pleasure, Three Gaited Show Pleasure, Western Country Pleasure Championships, and the ASB Hunter Country Pleasure. The ASB Hunter Country Pleasure division is rising in popularity and is a part of the World Championship horse show for the first time. Distinctive traits including mental acuteness and willingness to learn have positioned the Saddlebred as a diverse equine athlete. Revered as the “Horse America Made,” Devon Horse Show is proud to feature the talents of this historical breed. The Devon Horse Show and Country Fair is the longest running and largest outdoor multi-breed competition in the United States. With the grandeur of Philadelphia’s prestigious Main Line setting the stage, the event features a world-class field that annually ranks among the most prominent internationally. The event also includes the Country Fair that offers world-class shopping, rides and games for kids, multiple dining options, and special entertainment events. To purchase tickets to the 2019 Devon Horse Show and Country Fair, email tickets@devonhorseshow.org. For more information, visit www.DevonHorseShow.net. Week II of the Jacksonville Spring Classics is a busy one with the $5,000 Marshall & Sterling Classic Hunter Derby with Non Pro Rider Bonuses, $25,000 USHJA International Hunter Derby sponsored by Glen Kernan Golf and Country Club on the grass grand prix field, and the $35,000 Classic Company Grand Prix presented by EMO Insurance, slated for the indoor stadium complete with VIP seating. A portion of the proceeds from the table sales are donated to a local charity and they sell out fast. Wellington, FL – April 8, 2019 – Team Dublin sponsored by Horseware Ireland edged Team New York sponsored by Spy Coast Farm for the win in the third Gladiator Polo™ match of the season on Saturday, April 6, pushing them into the season finale to be hosted this Saturday against Team Palm Beach sponsored by Five Star Builders in U.S. Polo Assn. Coliseum at the International Polo Club Palm Beach (IPC). Team Dublin outpaced Team New York to finish the game on a final score of 20-18. The Gladiator Polo™ Championship Final will be hosted on Saturday, April 13 at 8:00 p.m.
A children’s Ninja Polo™ match featuring Team Miami vs. Team Buenos Aires will be hosted before the start of the final game. General admission and parking are free. Team Dublin, who was victorious in their first game over Team Los Angeles sponsored by Alugha, headed into this weekend’s match requiring an all-out effort from their talented team roster of Juan Martin Obregon, Tito Ruiz, and Mariano Obregon in order to move forward to the final game of the season. The trio came from behind in the first chukker and maintained their pace of play throughout the six chukker match. New York’s Pelon Escapite registered the first tally of the game before Juan Martin Obregon put Dublin on the board. Holding Team New York scoreless in the second chukker, Team Dublin went on an eight-point streak to lead 12-6 heading into the third chukker. The match evened out in the fifth chukker with Team Dublin only holding a two-goal lead heading into the last minutes of play, but rallied to add three scores pulling them within reach of the win. Mariano Obregon was awarded with MVP honors presented by Palm Beach Equine Clinic. The Gladiator Polo™ Championship Final is expected to be a fast-paced and intense match-up between this year’s two best teams. Team Palm Beach has notched wins in two stellar performances this season and Team Dublin hit their stride as a team following their well-played match against Team New York, dethroning the early season favorite. Team Palm Beach boasts a strong roster featuring arena veteran and inaugural first pick of the 2019 team draft, Tommy Biddle, who plays alongside talents Toro Ruiz and Geronimo Obregon. Team Dublin has shown their team grit in their first two matches and will need to bring their best game to the arena for Saturday’s showdown. The Ninja Polo™ match featuring Team Miami vs. Team Buenos Aires will be hosted before the start of the Gladiator Polo™ Championship Final set for this Saturday, April 13 at 8:00 p.m. with gates opening at 6:00 p.m. General admission and parking are FREE. To view the full Gladiator Polo™ 2019 schedule, click here. To learn more about Gladiator Polo™, please visit www.gladiatorpolo.com. Chris Ewanouski and Binja. Photo Credit ©AnneGittinsPhotography. Wellington, FL – April 9, 2019 – Chris Ewanouski of Wellington, FL and Binja, owned by Castle Point Farm LLC, rose to the top of the leaderboard in the $35,000 ProElite Spring I Grand Prix at Palm Beach International Equestrian Center (PBIEC) after dashing through the jump-off timers in 45.057 seconds. Lauren Tisbo of Wellington, FL piloted Tequestrian Farms, LLC entry Jeleena de Muze to second place with a jump-off time of 45.228 seconds. Margie Engle of Wellington, FL and her trusty partner Indigo rounded out the top three with a time of 45.307 seconds. The class saw 28 entries contest the Philip Devita designed track with 11 entries posting a clear effort in the first round to move forward to the jump-off. Ewanouski narrowly edged out Tisbo for the win, but Binja jumped efficiently in the second round to secure their win. “I felt great after the class. You always feel good after a result like that. The course was really well done for the Grand Prix and Philip did a great job. It worked well for Binja, especially the jump-off,” commented Ewanouski. “She’s normally very fast in the jump-off and I could make a few tight turns. She has a huge stride and there was a long run to the last jump in the jump-off and I made a really neat turn and just galloped as fast as I could at the last fence. It caught her attention just enough, but she’s that fast anyway and the jump-off worked in our favor. “We’ve had her for about two years. She’s owned by Castle Point Farm, who is a client of ours, Lindsay Strauffus. She showed her in the amateurs a bit last year and I started showing her over the summer. We did some good classes in Kentucky throughout the summer season,” he elaborated on the mare’s performance this past year. Ewanouski and Binja have produced impressive results together since he took over the ride, but ensured the mare was well-rested and feeling sharp for the ESP Spring Series, which their team felt better suited the mare. “We laid low during season a little bit and FEI is so competitive. She’s brave and very scopey and is super fun for me to show. We wanted to set her up for success this season, so we decided to have an easy WEF. She showed in some of the national classes with good results at the end of season. We were planning on gearing up for this circuit, which suits her really well. She’s really fresh and not tired and that worked in our favor. She came into last week’s show just a bit fresher than the others I think,” he explained. As for the future of the pair, Binja is for sale, but Ewanouski will continue to compete her throughout the spring and summer until she’s partnered with a new rider. The duo will look towards an FEI start in May if she is still part of the program, as the owners enjoy watching Ewanouski compete her. For full results from the $35,000 ProElite Spring I Grand Prix, click here. For more information on PBIEC, please visit www.pbiec.com.